The Mormons are members of the Church of Jesus Christ of Latter-day Saints, a church founded by Joseph Smith (1805-44) at Fayette in New York State in 1830. Smith attracted a small group of followers who settled at Kirtland, Ohio, and around Independence, Missouri. Because of conflicts with non-Mormons, the Mormons moved first to northern Missouri and then in 1839 to Nauvoo on the Illinois bank of the Mississippi. Persecution did the church no harm, merely enhancing the solidarity of its members. Smith preached the gathering of the faithful in one place and about 25,000 Mormons were soon living around Nauvoo and across the Mississippi in Iowa. Rumours about Smith’s unorthodox teachings, which included polygamy, caused conflict with non-Mormons and he was murdered by a mob in June 1844. 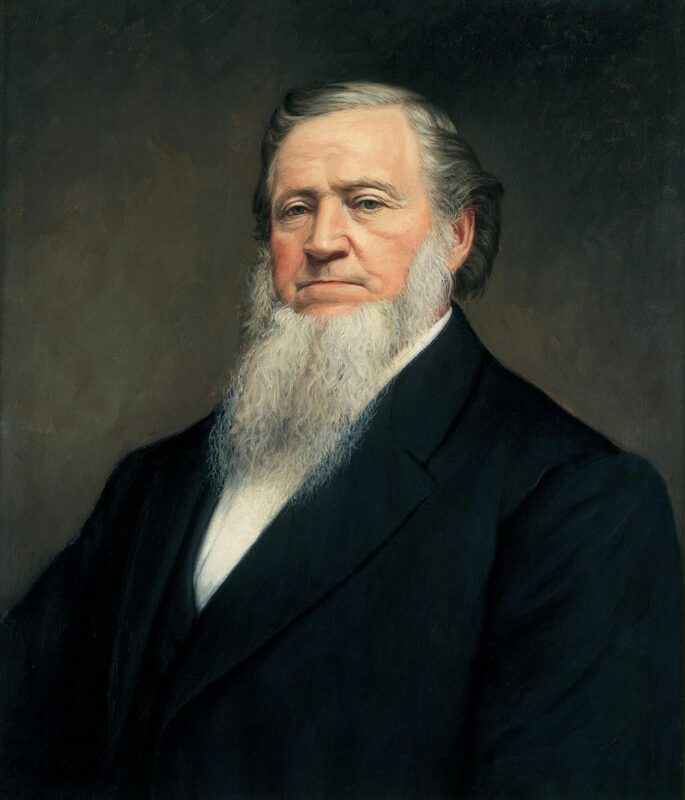 After Smith’s death, Brigham Young (1801-77) was chosen as leader church. A formidably gifted administrator, Young began to organize an exodus of Mormons to the west. His plan was to head for the Rockies find a suitable valley where they could create a religious community fret from the influence and persecution of non-Mormons. The Mormons saw themselves as Israelites and Brigham Young was their Moses. Between February and September 1846 the Mormons left Nauvoo, crossed the Mississippi into Iowa and began their ‘Great Migration’. Pioneers set out first to blaze the trail, found temporary settlements along the route, build a ferry on the Missouri at Council Bluffs. Parties began reaching Missouri in late June and crossed into Nebraska. Young and about 3500 Mormons spent the winter in cabins at Winter Quarters in Nebraska. Another 10,000 Mormons were living in the temporary settlements along the trail and as many more were scattered elsewhere in the Midwest. In April 1847 Young led the first party of 148 pioneers out of Winter Quarters for the Rockies. 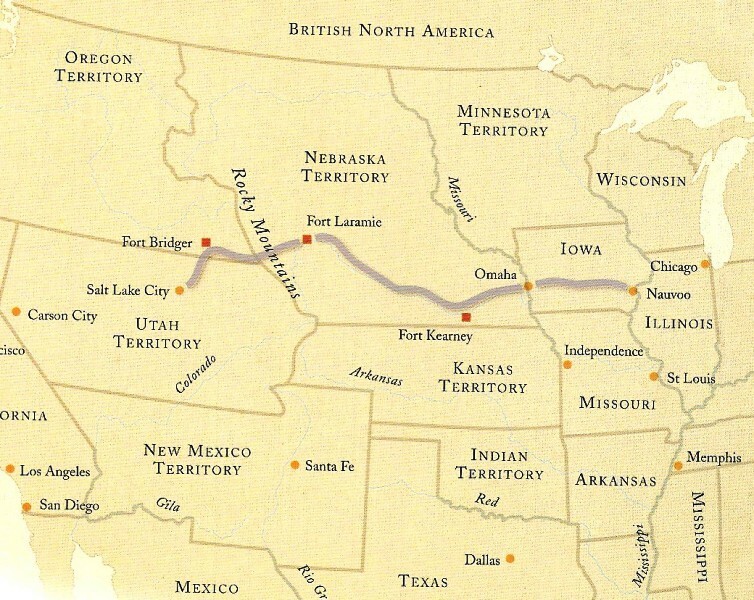 Their route followed the north bank of the Platte and North Platte rivers (the opposite bank to the Oregon Trail) as far as Fort Laramie. From there, the Mormons followed the Oregon Trail as far as Fort Bridger. Not wishing to settle near a migration route used by non-Mormons, Young left the Oregon Trail here and continued southwest for a further 100 miles (160 km) until arriving in the valley of the Great Salt Lake in Utah in late July. After a brief exploration, Young decreed that this was the place God meant them to settle and within days work had begun laying out Salt Lake City. The arid, mountain valley was unlike anything the Mormons had ever known, requiring them to learn completely new methods of farming, but it was a suitably biblical location, complete with its own Dead Sea. Following the pioneers was the Big Company of over 2000 migrants, which arrived in the valley in late September. Only six people had died of disease and one had been shot by Indians. Young and other leaders returned to Winter Quarters and in 1848 led another party of 2400 migrants to Utah. Gathering the Mormons remained a priority for Young. In 1848, after a good harvest had set the Mormons on the path to prosperity, the Perpetual Emigrating Fund was set up to make interest free loans to poor Mormons to help them migrate to Utah. The fund was first used to help those Mormons who had remained in the Midwest at the time of the Great Migration. Some 3000 wagons travelled the trail blazed by Young between 1849 and 1852, carrying over 20,000 people. Losses from disease were slight in comparison to those suffered on the less well organized non-Mormon wagon trains. 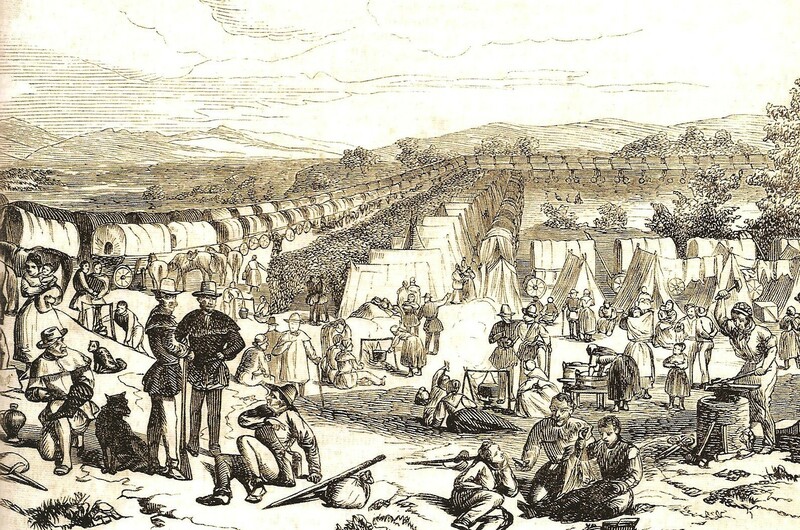 Once the Nauvoo refugees had been brought to Utah, the resources of the Perpetual Emigrating Fund were directed to gathering the Mormon converts from overseas. Mormon missionaries had enjoyed great success winning converts among poor industrial workers, especially in the grimy mill towns of northern England, who were only too willing to emigrate if given the opportunity. By the end of 1854, 15,642 British, 1002 Scandinavian and 50 German Mormons had been shipped out of Liverpool to begin the long journey to Utah. 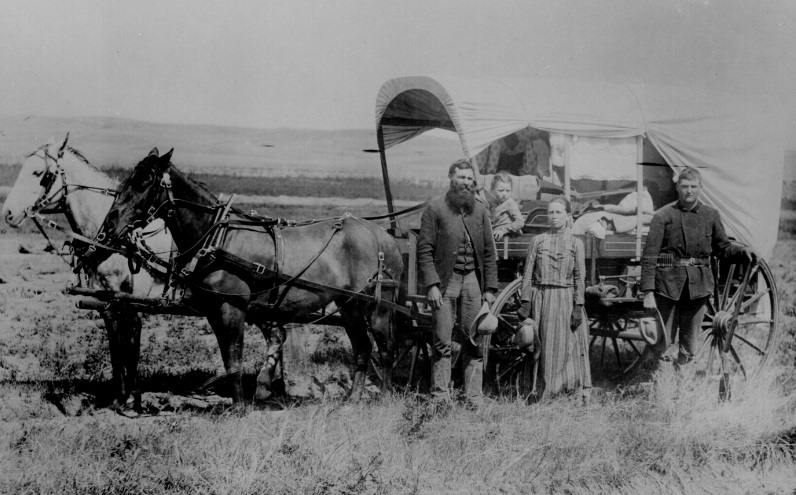 Mormon emigrants sailed on specially chartered ships and throughout their journeys they were accompanied by Mormon agents, who imposed discipline, organized provisions and hygiene on board ship, helped them through immigration on landing in America, arranged their transport to the West, procured wagons and supplies and guided them on the trail to Utah where they would be settled into a supportive community. As a result of this network, Mormons suffered few of the trials and tribulations experienced by other immigrants to the USA. When the Mormons arrived in Utah it was still part of Mexico. Following the end of the US-Mexican War (1846-8) a year later, Utah became part of the USA. In 1849 the Mormons proclaimed the State of Deseret and applied for recognition as a state of the Union. Deseret encompassed a vast area extending from the Oregon Territory in the north to the Mexican border in the south and from the continental divide in the east to the Pacific Ocean in the west. Congress refused to recognize Deseret and instead formed the smaller Utah Territory with Brigham Young as governor. 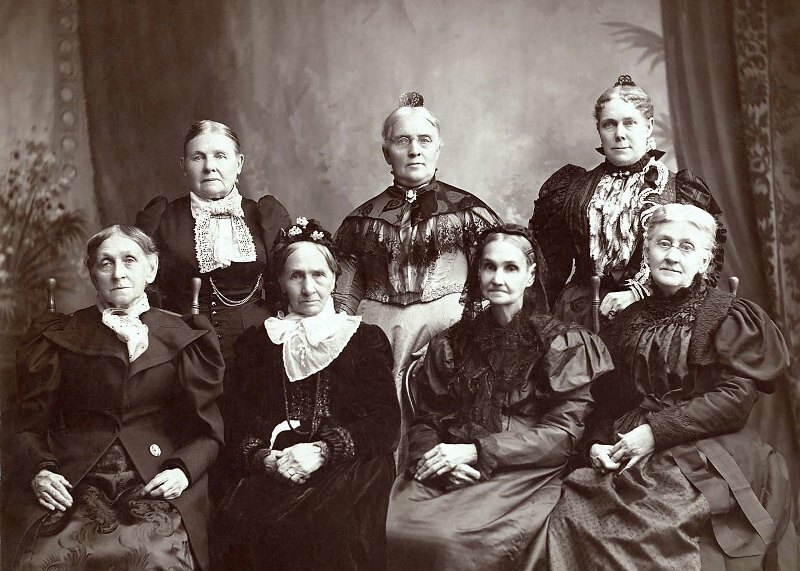 Utah was only granted statehood in 1896, after the Mormons renounced polygamy. The refusal of Congress to recognise Deseret left Young desperate to increase the number of Mormon settlers as quickly as possible to limit the influence of non-Mormons in Utah. A scheme to bring emigrants from Liverpool to Salt Lake City for £10 (about $48 at that time) proved uneconomic. More successful was a remarkable Los Angeles scheme to cross the Great Plains cheaply on foot with handcarts. Young took his inspiration from the California gold rush of 1849, which had seen prospectors heading for the goldfields with nothing but what they could carry on their backs or in a wheelbarrow. If people could migrate this way for gold, Young thought, they could certainly do so for God. The first two handcart companies of 500 English and Welsh Mormons set out from the railhead at Iowa City in early June 1856 and completed the 1400-mile (2240-km) journey in late September, having overtaken a Mormon wagon train on the way. The migrants were industrial workers, unused to outdoor life, and they pulling a cart loaded with 700 lbs (318 kg) of provisions and personal belongings was hard work, and it was even harder when a sick wife or child had to be carried too. Yet the migrants’ feet and muscles hardened as they trekked on and the two companies lost only 21 people to disease, most of them children. Two more companies made uneventful journeys that summer, but the last two, which did not leave until late July, did not make it out of the mountains before winter set in. Of the 1000 migrants, over 200 died of hunger and exposure. The casualties would have been far higher but for a heroic rescue mission launched from Salt Lake City. Another five handcart companies made the journey successfully between 1857 and 1860. The last made the trip with no fatalities. The final phase of the Mormon migration began in 1861, when the Church Trains were introduced to bring migrants to Utah cheaply. Instead of purchasing new wagons and draft animals for one-way trips from the Midwest, wagon trains loaded with grain were sent out from Salt Lake City in the early spring. Reaching Missouri in early summer, the grain was sold and the empty wagons returned loaded with migrants by the early autumn. The completion of the Union Pacific railroad in 1869 put the wagon trails out of business, but by that time the Church Trains had brought 23,000 migrants, most of whom were British, German and Scandinavian, to Utah. The railroad led to an influx of non-Mormon settlers into Utah, but Mormons still make up 70 percent of the state’s population.